This presentation is an alternate route up to Three Corner Rock. It is about the same distance and the easier route, but climbs very steeply for 1220 feet. One of the most challenging aspects of this hike is finding the trailhead. See the description below in the driving instructions. At first trail climbs vigorously through rather dense new growth timber consisting mostly of douglas fir and hemlock. In season the trail is lined with a large variety of beautiful wildflowers, which is one of the main draws to this hike. There are 17 switchbacks on this trail, which is a hint as to how challenging the hike is. 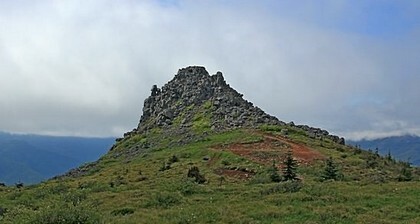 As you near the summit, you will the tall relay antenna that is on the bluff just across from the summit of Three Corner Rock. I mentioned that this hike is accessable spring through fall, but weather permitting, you can hike it all year round. From the Washington side of the Bridge of the Gods, drive SR 14 east to milepost 43. Turn left on Rock Creek Drive (signed for Skamania Lodge and Columbia Gorge Interpretive Center). At 0.3 mile, just past the entrance drive for Skamania Lodge, turn left on Foster Creek Road (which becomes Ryan Allen Road. At 0.9 mile, turn left on Red Bluff Road for 0.3 mile, then continue on gravel DNR Road CG 2000. Take this winding, uphill road along Rock Creek. At about 8.5 miles, the PCT crosses this road. 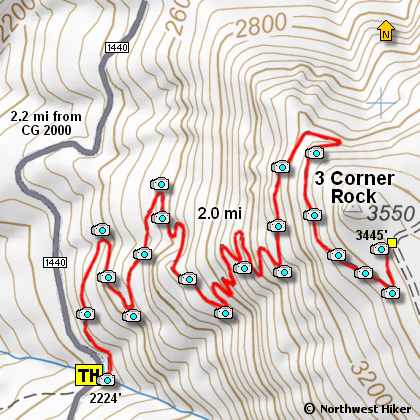 For this hike however, continue going uphill on CG 2000 to where it tops out at Rock Creek Pass. At the past CG 2000 curves to the right, and CG 1440 heads abruptly downhill and mostly straight ahead, follow 1440 for approximately 2.2 miles till an unnamed creek which flows under the road. At that point look to your left for a brown post which is the beginning of the trail.